In January 1778, Captain James Cook and his crew spent two weeks provisioning their ship in Kaua`i, their first stop in the archipelago he named the Sandwich Islands. They traded nails and scraps of iron for hogs, potatoes, taro, yams, and coconuts, but sightseeing wasn’t on the agenda. These days, most visitors come to the Garden Isle with relaxation in mind; sadly, locals no longer accept bags of nails as currency. The good news is that all the raves you’ve heard are true. 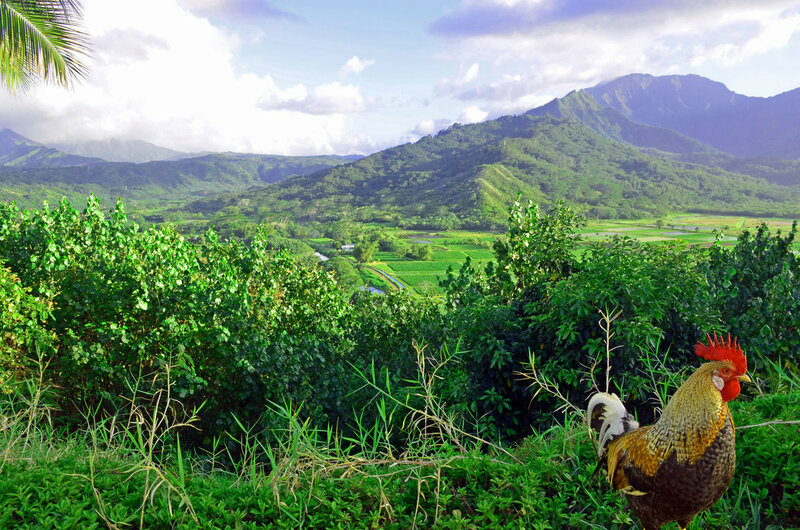 Kaua`i is a lush island with just the right mix of amenities and untamed beauty. Amid Kaua`is drowsy, dreamy landscape, you may be tempted to cocoon yourself poolside at a resort. But the Garden Isle is a place that rewards exploration and you won’t have to look hard to carve out your own little corner of paradise. Kaua`i has a fascinating history that’s worth investigating at the Kauai Museum ($15, adults). The museum’s director, Chucky Boy Chock, and volunteers love to share stories about seven-foot tall Hawaiian kings, Russia’s failed attempts to dominate the island in the early 19th century, the waves of immigrants who came to Kaua`i, and the Menehune, a mythical race of mischievous little people. You will also learn about the neighboring island of Ni`ihau, known as the Forbidden Island, which is owned by the descendants of Elizabeth Sinclair, who bought it from King Kamehameha IV in 1864 for $10,000 in gold. The island’s 100 or so inhabitants retain a traditional lifestyle, with no cars, internet or indoor plumbing. Helicopter and boat tours are permitted, but visitors cannot go to the island’s lone settlement unless invited by a local. At the museum’s gift shop, you can buy the distinctive shell jewelry made by Niihau’s skilled shell lei makers.